In July, I had a great trip to scope out different parts of the AT and was able to get in a couple hikes along the way. The trip also allowed us to meet and talk with hikers on the trail. We met thru hikers, section hikers, and day hikers. The first part of the trip I traveled with Gay and Steve who live in Florida, but have a cabin in Georgia near Springer Mountain. They are very interested in the Appalachian Trail culture. 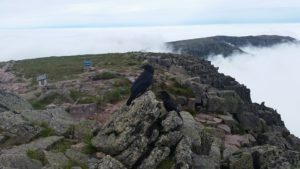 Most of all, I wanted to hike to the summit of Katahdin. a catalogue for the ATC’s Ultimate Appalachian Trail Store. We got rooms at the Harpers Ferry EconoLodge. Here I met four young men from the Mississippi gulf coast. They were NOBO hikers who had started at Springer Mountain. They looked strong and healthy and I am sure, barring unforeseen circumstances, they will complete their thru-hike. 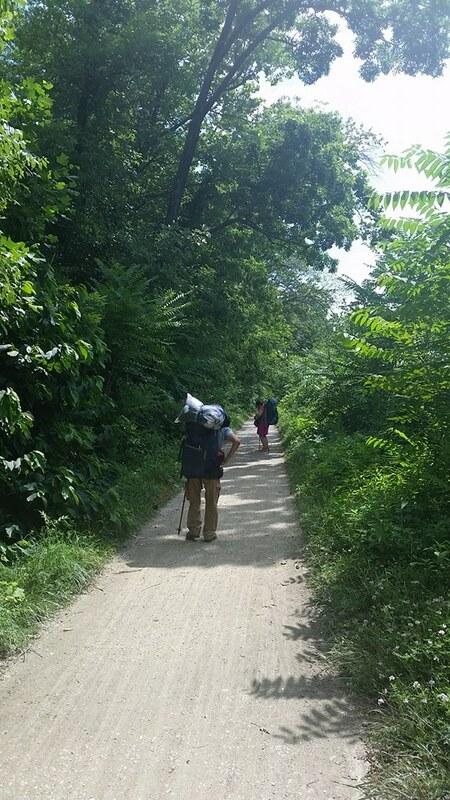 The next day, we decided to check out the trail heading north out of Harpers Ferry. This must be one of the easiest parts of the trail. It is a very level towpath which follows along the north shore of the Potomac River for about three miles. This path is heavily used by hikers, joggers, and bicyclists. 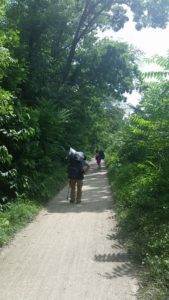 We stopped to talk to a man who was looking for a path going north from the towpath that crossed the railroad track and would take him toward an outfitter’s store. While we were talking with him, the four young men I had met the previous evening hiked up. They got into a conversation with the man who told them that the outfitter offered river tubing on the Potomac. The four then had a discussion on whether to hike or go tubing. They chose tubing. They are an example of hikers who are making the most of their experience by being flexible and taking advantage of fun opportunities along the trail. After leaving Harpers Ferry, we drove a couple days to Millinocket, ME with the objective of going to Baxter State Park for a day hike. In spite of warnings that parking in Baxter State Park is limited, we found out that plenty of parking was available at Roaring Brook Campground. This was apparently due to the rainy weather. I decided to take Chimney Pond and Saddle trails to get to Baxter Peak on Katahdin. It was a nice hike with some scrambling over boulders the last couple miles. I left at 9:30 a.m., which is considered a late start, so, when I met the ranger at Chimney Pond Campground, she wanted to make sure that I had a headlamp; I told her I had two. She laughed and said that she also carried two. I told her my turn-around time was 3:30. She said to be on the safe side, I might want to consider 3:00. I agreed, signed the log book and continued on my hike. I got to Baxter Peak at 2:30 p.m. The number of people up there (I counted 18) surprised me. I hung around for a while watching people and eating lunch. I asked some people to take my picture using my camera, and I returned the favor. One person I met noticed that I was wearing gloves and said she wished that she had thought of that – her hands had little cuts and scrapes from scrambling up the boulders. Some ravens were hanging around looking for crumbs. At 3:00 I headed back down and got back to Roaring Brook Campground at 7:00 p.m. I am very excited about starting my thru-hike next year and will start at Katahdin and do a SOBO to Springer Mountain. I know that some people say that Springer Mountain is an anticlimactic way to end an Appalachian Trail thru hike, but, hey, I can live with that.